A backyard deck is one of the best ways to enjoy the outside and expand your living space, and a vinyl deck is one of the best decks you can get. If you don’t have any experience with vinyl decks, though, you might have questions or concerns about installing one at your home. 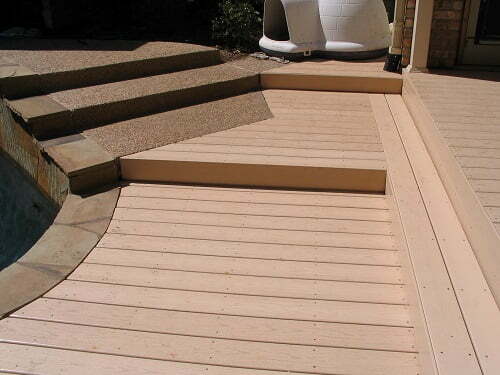 Here are a few of the most common questions we hear about vinyl decking. What Are Vinyl Decks Made Of? The vinyl we use for our vinyl decks is similar to the vinyl used in our other vinyl products, but it’s formulated especially for decking. At Future Outdoors we offer VekaDeck vinyl decking, a 100% PVC vinyl deck made with cellular PVC technology. These decks are made of extruded PVC with a high amount of UV blockers and impact modifiers for added strength and durability. Unlike cheap composite decks or standard wood decks, a vinyl deck from Future Outdoors will never corrode, chip, blister, or warp. These decks are also extremely fade-resistant and virtually maintenance-free. Are Vinyl Decks Better than Wood? Vinyl decks are more durable than wood. A well-built vinyl deck will last a lifetime, in contrast to a wood deck which will need to be replaced eventually. Vinyl decks require far less upkeep and maintenance than wood ones. Vinyl decks keep their appearance better than wood. They don’t weather or fade over time and never rot. Vinyl decks are a better value than wood over time, since they need virtually no upkeep or repair. Once you buy a vinyl deck you may never need to spend money on it again. How Do I Care For a Vinyl Deck? Unlike wooden decks which need regular painting or staining, a vinyl deck doesn’t need more than the most basic maintenance. You’ll never need to stain or seal a vinyl deck and it’s not vulnerable to rot, insect damage, mold, mildew, or other natural hazards. You may occasionally want to spray your deck down with a hose or wash it with a mild soap to clear away any dirt accumulation, but even this isn’t strictly necessary. One of the best things about vinyl decks is they are virtually maintenance-free, even in a punishing climate like ours here in Texas. One common criticism many people level at vinyl decks is that they look plasticy or “fake.” This may have been true of older vinyl decks using simple manufacturing methods, but the story is different today. Modern vinyl decks approximate the look and texture of wood without the drawbacks. They come in a variety of colors, too, including colors that look like wood, allowing you to get the look you want without paint or stain. If you’re considering a vinyl deck for your backyard or around your pool, you may have heard vinyl becomes slippery with rain or water exposure. Again, this may have been true for older vinyl decks. Modern decks, though, are built with textured surfaces that channel water away and provide traction even in heavy rains. The feel of a vinyl deck underfoot is very similar to the feel of wood or composite decking. Our vinyl decks are engineered with an anti-skid surface which provides excellent grip when wet or dry, making it perfect for pool decking and backyards. Fading and yellowing in the sun were major problems with older styles of vinyl. Modern vinyl decks, on the other hand, don’t suffer from these problems. Because we manufacture our decks from 100% PVC with a high level of color stabilizers, they don’t suffer from sun exposure problems like fading, yellowing, or chalkiness. While Texas is well-known for its hot, dry summers, we also suffer from plenty of cold weather as well. One common misconception about vinyl decks is they become brittle and break easily in cold weather. In truth, vinyl decks stand up very well to the cold. Vinyl doesn’t expand or contract as much as wood with temperature changes, so it stays secure year after year. It also doesn’t become brittle in normal cold weather; modern vinyl remains flexible down to extremely low temperatures, far colder than what we experience in Dallas. Many homeowners enjoy cooking out on their back porch or placing an elevated fire pit on the deck for cool nights. Contrary to popular belief, there is no problem with doing these activities on a vinyl deck if you take the right precautions. Vinyl can melt when exposed to fire or very high heat, but grills – which are raised off the ground – and shielded fire pits are not an issue. You can also place heat shield tiles or pavers below your grill or fire pit for extra protection. Plus, our vinyl decks at Future Outdoors self-extinguish in the event of fire, making them much safer than wood or composite decks. 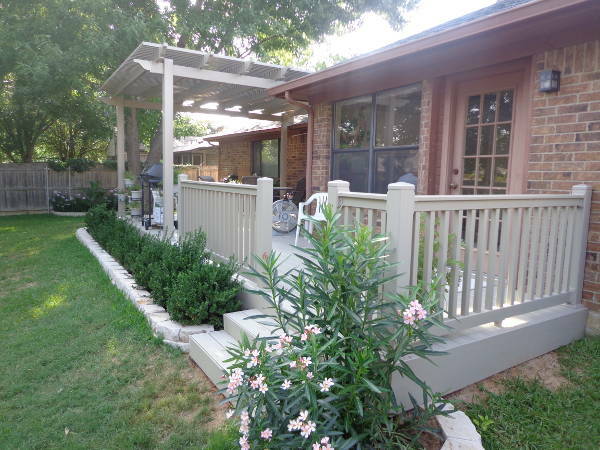 Looking for a new deck for your home? A vinyl deck will last longer, need less maintenance, and cost less over time than wood. If you’re ready to get a vinyl deck in or around Dallas, call Future Outdoors today at 972-576-1600. We’ll help you decide what kind of deck is right for you and give you all the information you need. You can also follow our Facebook page for more updates and ideas on how to improve your home.